The 'Manage Network Connections' interface allows you to quickly view all wired and wireless networks to which your computer is connected. The lower half of the panel displays details about each network including its name, IP address and gateway. Use the refresh button if you have recently made network changes and these are not yet visible in the interface. The 'Manage 'Networks' interface can be opened by clicking 'Tasks > Firewall Tasks > Manage Networks'. 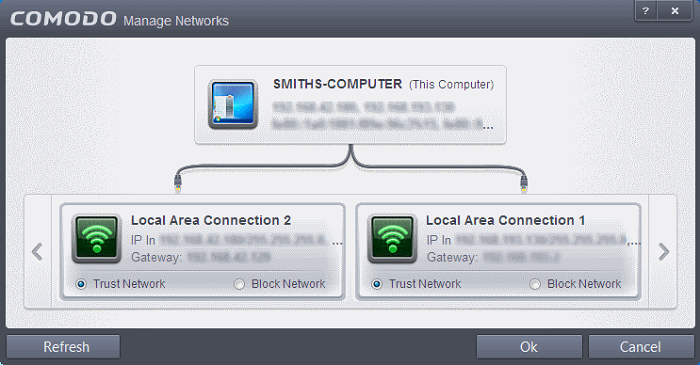 To view create or block Network Zones, click 'Tasks > Firewall Tasks > Open Advanced Settings > Network Zones'.